The title of Ken Loach’s new film is also the name of an Irish folk song that marks a key, early moment in his drama. We’re in the Irish countryside in 1920 – a farming village in County Cork, to be exact – and British troops, a band of ‘Black and Tans’, have just murdered Micheail, a young Irish man who refused to speak his name in English after his arrest for playing an illegal game of hurling. Loach cuts to Micheail’s funeral and the lad’s body, his head propped up with a crude block of wood, lies in his family’s cottage, ready for burial. His family and friends gather round, and together they sing in low voices the words of The Wind That Shakes the Barley, a song that mourns ‘the shame of foreign chains around us’. It’s not an historical event. Nor is Micheail a politician, a particular hero, or even a character with whom we’ve spent more than five minutes. Instead he’s a fictional, anonymous rural labourer invented by Loach and his regular screenwriter Paul Laverty to represent the brutality of the military (many of them fresh from WWI) in Ireland at that time, when the British government was faced with an violent republican movement operating in the wake of the Easter Rising of 1916. 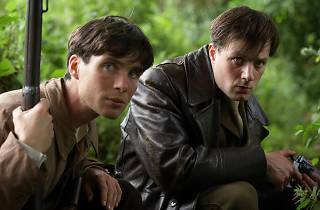 Loach’s aim is to turn the political into the personal – to spin national pain into local tragedy – and Micheail’s death marks the politicisation of the film’s main character: Damien (Cillian Murphy) is a friend of the dead man and a doctor who’s about to move to London but who instead decides to join his brother Teddy (Padraic Delaney) in a guerilla unit – a ‘flying column’ – of the Irish Republican Army. For a significant part of the film, we follow Damien, Teddy and comrades as they wage a small war on British troops in their area. An engaging, ensemble cast of Cork actors (and one Dubliner, Liam Cunningham) serve Loach very well, barren Cork locations lend authenticity to the drama, and the accents and dialogue are credible and enjoyable. This is not a celebration of terrorism – as some commentators have implied – but rather a considered comment on what drives ordinary men and women to politics and violence. It’s cloaked in a terrible sadness, not glee. The mood is anything but triumphant. I’d even say that Loach’s desire to document plainly – never to glorify – the IRA’s actions accounts for some of the film’s few flat moments (moments which may also be explained by the production’s small budget and perhaps even our conditioning by other, more bombastic war movies). Loach certainly plumps for the republican cause, but his presentation of their actions is complex and balanced. That Damien and his comrades are driven by historical forces is stressed in a devastating scene in which they execute a traitor – a friend – among them. That their actions are as vicious as their counterparts in the Black and Tans is made clear when they march Sir John Hamilton (Roger Allam), a British landlord onto a windswept hillside and assassinate him. Beyond the human cost of history, Loach has another interest: the projected, disputed and failed plans for an independent Ireland that was also socialist. Damien declares, ‘I hope this Ireland we’re fighting for is worth it,’ and in a prison scene, Damien and his IRA colleague Dan (Cunningham) reminisce romantically about their shared following of the executed republican socialist James Connolly. In a later scene, before the film tips into the devastation of civil war, a group of republicans, including Damien and Teddy, debate their future course of action – whether to dispute the Irish Free State treaty of 1921 or to lay down their arms. If such scenes feel like political debate made real, that’s exactly what they are: how else could a civil war come about other than through heated argument? It is in these scenes too that Loach demands real engagement with the ideas of the period. The film ends with death, personal and political. Families are broken. The socialist dream has failed. Here, as in Land and Freedom, Loach captures a moment when a united left could have led to freedom and socialism. There’s nothing disingenuous about Loach’s aims. He’s a socialist; he’s a critic of oppressive governments; he’s concerned with the politicisation of the people; he’s a chronicler of lost political opportunities. His argument – whether you agree with it or not – is clear and honest. 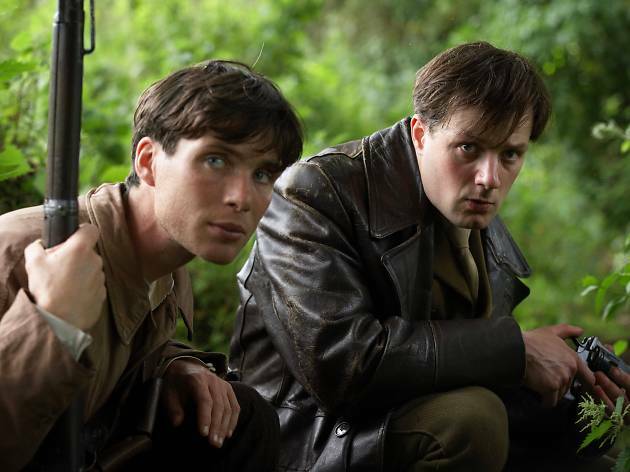 All that’s come before in Loach’s work comes together again in The Wind That Shakes the Barley, a stirring lament for good human beings caught in the crossfire of history.